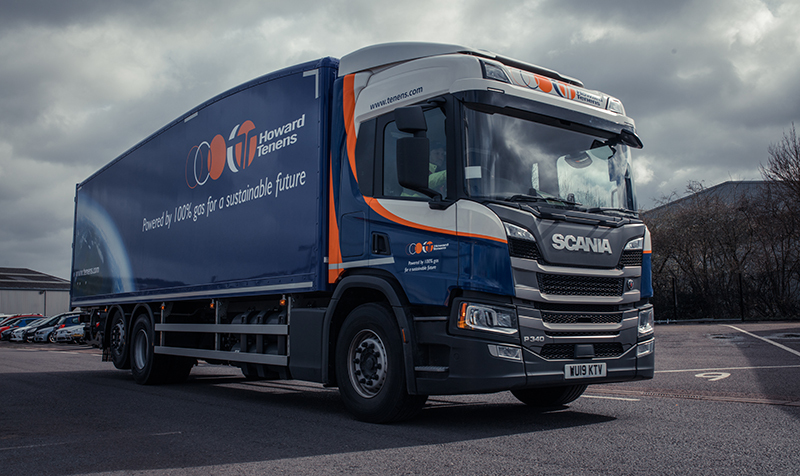 Howard Tenens has recently taken delivery of two 26 ton 340 BHP dedicated CNG rigid trucks from Scania, bringing the total number of dedicated natural gas vehicles to four. The purchase of the new trucks was made following the highly successful trial of two Scania 26 ton natural gas rigids which began in October 2017 and which were the first of their type in the UK. As per the first two vehicles, Don Bur was selected to offer the trailer bodies with their iconic Teardrop design to improve aerodynamic flow and reduce fuel consumption. All four vehicles are based in Swindon and are being trialed under the Dedicated to Gas Project which is part of the Low Emission Freight and Logistics Trial, funded by the Office for Low Emission Vehicles (OLEV) in partnership with Innovate UK. The first two vehicles have already traveled over 200,000 km to date. During that time there have been zero breakdowns or faults with the gas system. This excellent performance gave Howard Tenens the confidence it needed to invest in a further two vehicles when the opportunity arose. Furthermore, the vehicles have had excellent driver feedback with no difference in performance observed between the diesel and natural gas models. The two new rigids are the latest generation models and have improved fuel efficiency and range compared to the existing models. The performance of the vehicles will be carefully monitored and evaluated throughout the trial, answering prevalent questions regarding fuel efficiency, reliability and cost as well as the environmental benefits compared to conventional diesel-powered vehicles. The dedicated natural gas trucks are powered solely by biomethane, which gives a reduction in carbon dioxide emissions of 75% compared to diesel. “Our aim is to be a leader in sustainable logistics and actively embrace innovation and new technologies. We are delighted that our trial of dedicated natural gas technology has been so successful to date and that we now have the confidence to add two more vehicles to the fleet. Bringing new solutions to environmental problems is part and parcel of what we do as a business, helping to reduce our own carbon footprint and that of our customers,” said Ben Morris, Howard Tenens Executive Director.